This volume of Advances Anatomy Embryology and Cell Biology focuses on the emerging field of bio-image informatics, presenting novel and exciting ways of handling and interpreting large image data sets. A collection of focused reviews written by key players in the field highlights the major directions and provides an excellent reference work for both young and experienced researchers. 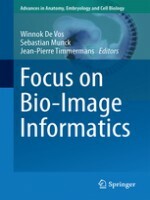 This book exhibits a practical approach to extracting knowledge from biological images, descriptions of bioinformatics tools for the analysis of biological images and an extensive inclusion of chapters on open source tools and data storage.